Cooler weather calls for comforting, hearty meals. 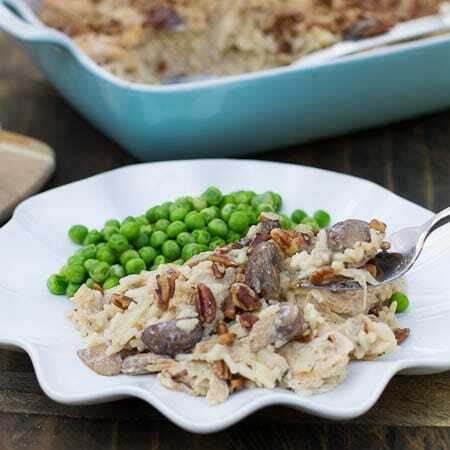 This chicken and rice casserole with mushrooms fits the bill. Pecans on top add a crunchy butteriness. It’s a great way to use up leftover chicken (or turkey). A rotisserie chicken can be used instead. This recipe is made from scratch so it will appeal to those who have an aversion to canned cream soups. 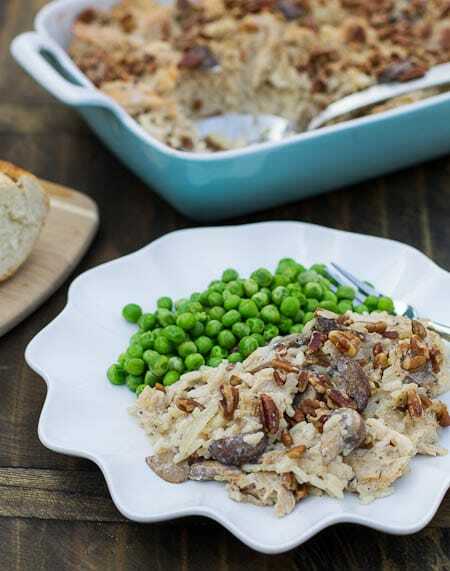 Best things about casseroles is they’re a complete meal in one dish and they make a delicious dinner any night of the week. I added some frozen peas as an easy side just to lighten (and brighten) the meal up a bit. This is a recipe from From a Southern Oven: The Savories, The Sweets that I’ve adapted some. From A Southern Oven is a new addition to my cookbook collection and it has lots of interesting recipes that I can’t wait to try including Muscadine Mystery Cake, Sweet Potato Schnitzel, ,and Pecan-and-Rice Stuffed Vidalias. There’s also a recipe for Baked Curried Deviled Eggs. In all my years of looking through cookbooks I’ve never seen such a recipe. Preheat oven to 375 degrees. Lightly butter a 2 1/2 quart casserole and set aside. In a large skillet, melt 1 tablespoon butter over medium-high heat. Add mushrooms and cook, stirring frequently, 8 to 10 minutes. Use a slotted spoon to transfer mushrooms to a small bowl. Add sherry to bowl and set aside. Add remaining butter to skillet and sauté onion and celery until lightly browned, about 5 to 6 minutes. Sprinkle flour, salt, pepper, thyme, and sage over onions. Use a whisk to stir the flour/onion mixture for 1 minute. Gradually add broth, whisking to incorporate it into flour. Whisk in half-and-half and cook, stirring frequently, until mixture boils and thickens, about 3 to 5 minutes. Season with additional salt and pepper if desired. Return mushrooms along with sherry to the skillet. Mix in cooked rice, chicken, and parmesan cheese. Transfer mixture to prepared casserole dish. Top with pecans. Bake uncovered for 25 minutes, until bubbling. This entry was posted in Casseroles, Main Dishes and tagged chicken, poultry, southern casseroles, southern recipes. Bookmark the permalink. 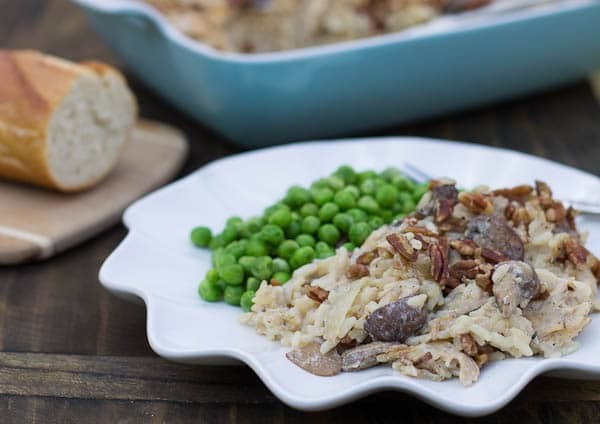 Love casseroles and this one sounds great with all the hearty flavors and a what a great way to use up any leftover chicken 🙂 Love the crunch from the added pecans too – yum! Ooh, I love a good casserole. I think I could eat this everyday!